For the last two years NHL has asked to grow sunflowers and other items during the spring and summer. Year one we had sunflowers in a patch of our garden. Apparently they were quite tasty – our friendly neighborhood bunny enjoyed them all. NHL was devastated. Last year we bought organic spray to keep those bunnies from eating the plants. Too bad the spray did not help again the hail that mutilated the poor plants. This year we set out again to attempt to grow sunflowes. They grew nicely inside our front porch at first. Then we put them outside and brought them in when we heard storms were approaching. We did not have the heart to leave them outside after the history we had. While visiting Aunt M during the 4th of July, she gave NHL a teeny tiny little cucumber plant. It was not looking the best when we got home. We loved it and cared for it ,no I did not talk to it, sorry I do draw the line. Before we knew it, the little plant had quadrupled in size. Thursday when I arrived home from taking NHL to his summer program I noticed something by the flowers on the plant. 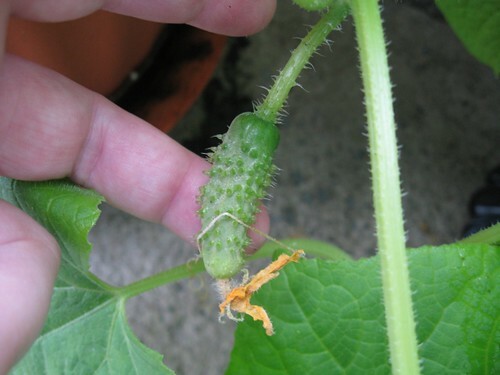 Sure enough, there were teeny, tiny baby cucumbers growing! NHL was thrilled when he saw them. Just within the last 24 hours they have grown a lot more and quite a few more are now visible. Wahoo! The sunflowers are still growing nicely. One is so close to opening up. I have a few photos, but will upload those later. We just hope that the pesky birds do not destroy the flowers once they open. The birds have already taken every rose that bloomed and our gorgeous lillies as well. Oh, we did learn a lesson. Next year we will get the already grown plants and not even bother with seeds, too much work and they never seem to grow as well. Did you win anything during the Bloggy Summer Carnival? I did!!! Two items actually, plus I gave one away. One of the items actually arrived this week. You should have heard me jumping up and and yelling when I saw the package as I opened the door. NHL and JSL surely must have thought that Mommy had completely lost it. Seriously, I was the lucky winner out of 548 entries to get the Nintendo DS that she was giving away! Secretly I had always wanted one, but never could justify it. We talked about it for NHL’s birthday, but again could not see spending the money on something at this point. I was blown away when I received the e-mail from Christina telling me the news. I have used the birthday money that I never spent from December and bought a few games. We are also looking into some more kid friendly ones for NHL. He is anxious to test it out, but we are waiting for the screen saver to arrive first. For now he helps me out. Any suggestions on games for a mommy that loves puzzles and things like Dr. Mario and Tetris or for an almost 5 year old little boy would be greatly appreciated. Thanks again to Christina for her generous gift. This weekend is action packed. Today we will spend the day at the lake with family to celebrate my father’s 60th birthday. It should be a great day of playing in sand, swimming in the lake/pool, and going on the boat. After we get home JL and I have to prepare foods for NHL’s family 5th birthday party on Sunday. We already baked the giant cupcake that will form the volcano and put it in the freezer. So much to do and so little time. Eventually I will catch up on NHL’s birthday party from last week with his friend IA. Of course Mommy also needs to sit down and cry to write about her big boy (technically still my baby) turning five on Sunday. That’s great about the cucumbers! We planted lima beans, at this point I have 6 beans saved up to cook when we have more. lol. Tie cheese cloth around the sunflower bloom when it opens. It keeps the birds off. So says my dad anyway. 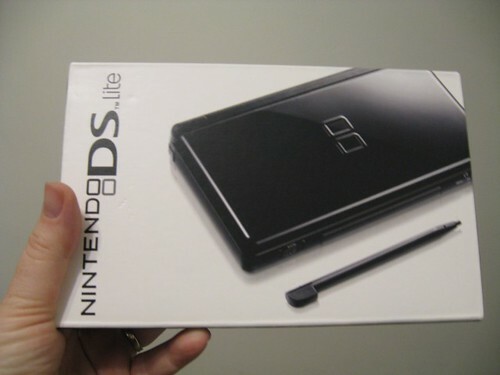 I want a DS so bad! The brain teaser game looks like loads of fun. Congrats! Cucumbers look good- they grow fast!! 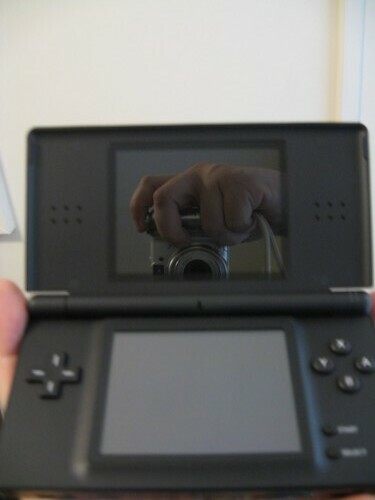 Congrats on the DS I am a little Jealous! CONGRATS on your win! I’m jealous, we’re HOPING to get our daughter one of those for her birthday, but with the way things are going, who knows. I wanted to say thanks for keeping us in your T&P’s. Hopefully one of the interviews Rodney has next week lands him a great job. Y’all should be set for cucumbers and pickles. If the birds don’t take them, do a post on harvesting the sunflower seeds. I’d like to see if it’s worth trying to grow a few at some point. Oh wow!! You scored big time! Enjoy it!